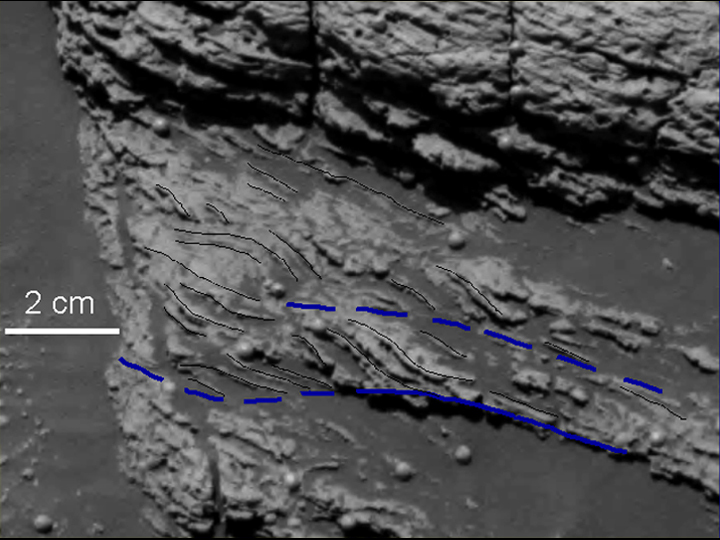 This view of the lower portion of the martian rock called "Last Chance" shows a close-up of texture interpreted as cross-lamination evidence that sediments forming the rock were laid down in flowing water. NASA's Opportunity took the original image during the rover's 38th sol in Mars' Meridiani Planum region (March 2, 2004). In the central part of the image, the dip of fine layers at angles to each other (cross laminae) suggests that the water that created the cross-lamination was flowing from left to right. Interpretive black lines trace these cross-laminae. Interpretive blue lines indicate boundaries of possible sets of cross-laminae. A three-dimensional visualization of this portion of the rock offers additional details of the cross-lamination. The visualization and the image from the panoramic camera are compared to show a point of correlation (yellow arrow).